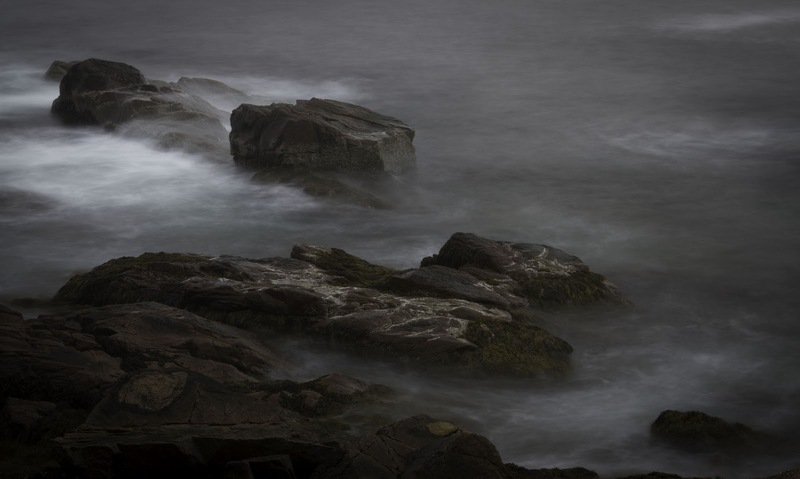 Some of the most fun I had during our recent trip to Maine was taking long-exposure (multiple seconds) pictures of waves. 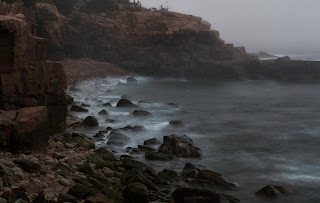 While Annette was participating in the Photography Workshop, I went out near Thunder Hole with the wife of another workshop participant. No sense in sitting in the room!!! 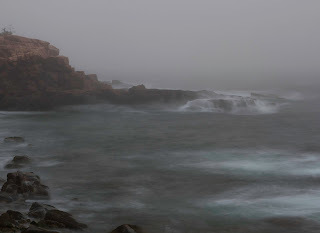 I went out on the rocks to the left of the Thunder Hole observation area and searched for a composition that I liked. It wasn’t hard! 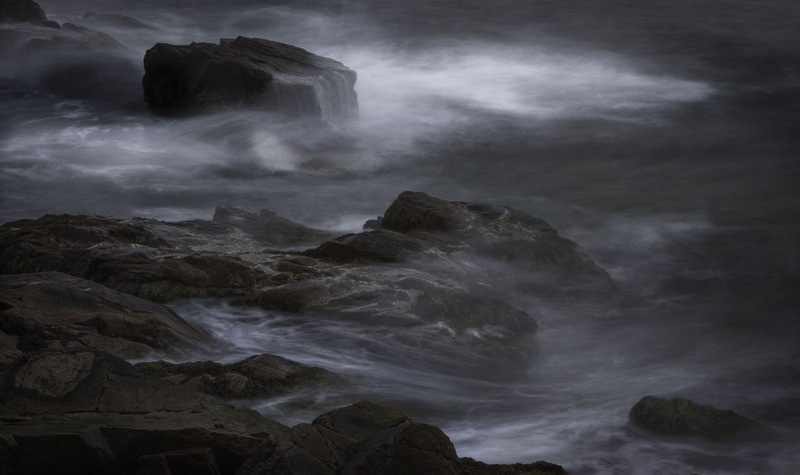 I had envisioned swirling waves on the rocks. I was not looking to freeze the sprays of water that happen when the waves crash into the rocks. 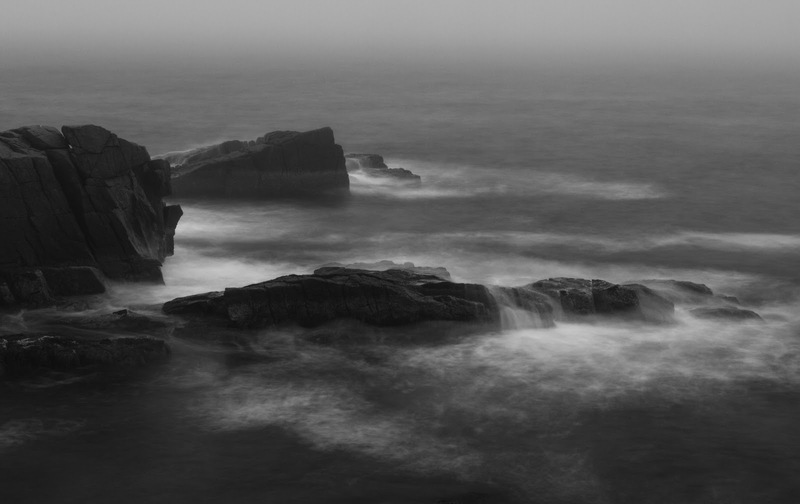 Therefore, I had to get the length of the shutter opening up to several seconds so that the waves were not frozen in place. Unfortunately, it was still in the afternoon and, although it was foggy, the sun was still above the horizon. So I started with ISO and turned it down to the lowest ISO possible in my camera (100 ISO). Then I chose the smallest aperture available (F22). Being on Aperture priority mode, the camera chose the shutter speed. But at that time of day, it was still less than a second. Too short for my purposes! So I put on a 4-stop neutral density filter. Now we were getting close, but I still wanted a longer shutter speed. So, I put on the circular polarizer and adjusted it until the scene looked the darkest. Finally, I had a shutter opening of several seconds! I took a couple of pictures and checked the back of the camera. Oh, wow! I think I might get something here! I shot a lot of pictures because you can never predict how the waves will look in the image. Every one is different. I would probably stayed there until dark, but my companion was not a photographer and after a short time, wanted to move on. See what you think of these images. I would love to see your comments! Annette was intrigued by these images and had to have some of her own. So after the workshop, she and I went out to the same place and took some more pictures. However, the tide was much further out when we arrived there. So the rocks that were catching the waves when I was there earlier, were completely exposed and nearly dry! So…Take the picture when you see it. You never know if it will be there when you get back! ← Fog. Help or Hinderance?